Home BUSINESS CHARITY/ COMMUNITY SERVICE EDUCATION SUPREME TENSION: Hundreds of pupils not yet reported to school. SUPREME TENSION: Hundreds of pupils not yet reported to school. 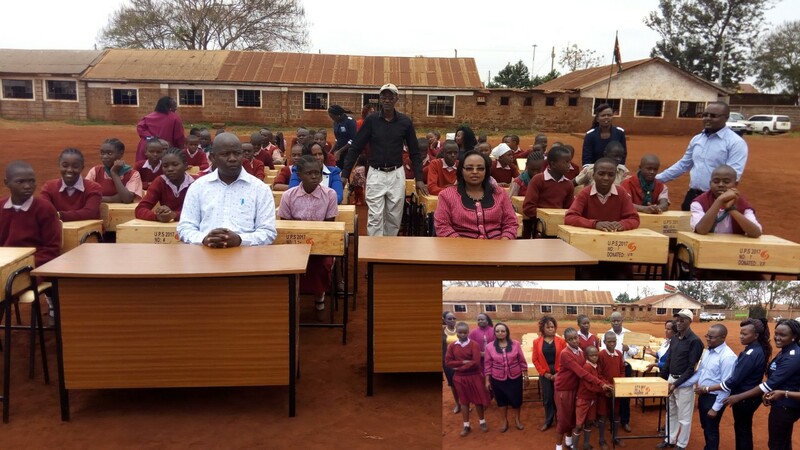 Staff of Vinepack Limited present 60 desks to Umoja Primary School to help ease the problem of congestion in classes. Some Thika residents who had travelled to their rural homes days before the August 8 General Elections are yet to return from their hometowns due to what is presumed to be ethnic fear pending today’s Supreme Court ruling on the presidential petition that is disputing the re-election of President Uhuru Kenyatta. Consequently, hundreds of school going pupils are yet to report to school, a week after learning kicked off for the final term of the year. This revelation was noted during an event at Umoja Primary School where a local, Vinepack Limited, donated 60 pupils’ lockers and chairs and two teachers’ desks and chairs. Isaac Maina Mburu, the Curriculum Support Officer Kenyatta-Kamenu Zone in Thika West Sub-County noted with concern that a hundred and twenty (120) pupils in the school were yet to report for classes after the August holidays. Although Mr. Maina did not directly link the pending Supreme Court ruling to the current scenario, a close examination of their identities revealed that the origin of majority of those who have not yet reported back to school could be traced from Western Kenya, Nyanza and parts of Ukambani. The scenario was a replica in Barracks Primary School where over 500 pupils were yet to report. “As educators, we are really concerned of the high number of absentee pupils, especially those who travelled to other counties days before the just concluded elections. We are just appealing to their parents and guardians to make arrangements for the kids to report to school as the situation in the country was calm and no cause for alarm,” said Mr. Mburu. Stressing that the education of their children was paramount, the officer asserted that there were no security concerns in the area and it was only prudent for them to avail their children to class to avoid them from losing too much of their precious class time. The school Headteacher Mr. Kibara Angevi admitted that the elections had some adverse effects to their normal programmes as quite a good number of their learners were yet to report. This, he said, was definitely going to affect the general academic performance of the school. “We suspect that their parents are just waiting for the outcome of the Supreme Court ruling, probably for fear of possible skirmishes. We hope all this will get behind us soonest possible to save our children from things that they barely know anything about,” said Angevi. He reckoned that for the past few years, his school had been experiencing a myriad of challenges in infrastructure and thanked Vineyard Limited for their kind gesture. He appealed to other companies and leaders to follow suit and come to the aid of the school. “For pupils to perform well, the school environment must be conducive for learning. We are appealing to other companies and our leaders to join hands and assist us to improve the infrastructure in this school so that our pupils can learn well,” he said. On behalf of Vineyard Limited, James Kamau who is the fleet manager promised that the company would not tire to work with the local community in improving the lives of those around them. “Being part of this community, we promise that we will do all what is humanly possible to improve the lives of those around us. And let me say that, we will not hesitate to come and assist again whenever need be,” said Kamau. He appealed to other companies to exercise their corporate social responsibility to improve the lives of others. “As Vinepack, we believe that strong companies build strong communities and strong communities build strong companies. We will work to improve our communities and build a better future for all and make a bigger difference together. Other companies should take keen interest in making the world a better place for all,” concluded Kamau.